This blog post is a submission for the 2019 Spring Equinox Tarot Blog Hop! Follow along and feel free to comment. Be sure to hit the links above or below to see what other tarot bloggers have to say about the same topic! I decided to work with the theme question: Which tarot cards represent you professionally or personally? I chose this theme because I think it is excellent information to have when you are trying to get to know a tarot reader and I believe the cards I chose for myself say a great deal about who I am as a person and my intention as a professional tarot reader. To honor the Spring Equinox, I am using the Prisma Visions Tarot deck. This deck has a lot of color, energy, sparkle and optimism! Which, in my mind is perfect for the Spring Equinox. King of Chalices: I chose the King of Chalices as my significator, knowing in my heart-of-hearts that even though personally, I am thoroughly Aquarian, professionally, my psychic gifts are as an intuitive and an empath. I am in touch with the emotional undercurrent. I feel. I also believe the spiritual messages I receive are “of the people”. I am able to tap in and channel insight or messages from the people my clients have loved and lost, even if that love was not expressed here on Earth. I also have effective listening skills. I assist clients with creating questions that will assist them. Part of my work is to simplify, synthesize and to reflect back information with sensitivity and compassion. I am freewill-oriented and I want to be as accurate as possible. My intention is always to emotionally elevate and to empower my clients. Personally, I am also interested in emotional depth and connection with the people around me. 9 of Pentacles: I would be amiss if I didn’t include the 9 of Pentacles as a card to represent me. I am someone who needs lots of space and my need for freedom and independence is a huge component of my personality. I also identify with my generation of Gen-Xer’s, which simply means, I like to do things my own way. As a process-oriented person, I also identify with learning as you go and experimentation. The 9 of Pentacles also expresses how hard I have to work to keep all of the parts moving! Ace of Swords: My mantra is healthy boundaries keep us safe. I’ve expressed this in various ways since childhood. I do a lot work with clients around helping them to establish safe boundaries and to communicate clearly and effectively with the people in their lives. The Ace of Swords is also an indicator of how justice oriented I am. I am very concerned with what is fair, right, or just. Integrity means a great deal to me. 3 of Chalices: I put a lot of time into networking with like-minded people. I adore collaboration. I’ve also worked as a tarot reader in a wine bar for the past 6 years (one of my tarot pop-up locations), so the 3 of Chalices says a great deal to me about light-hearted and celebratory fun, connection and healing. I also happen to work with a lot of women. Personally, I like to connect with people who are on a path of self-healing and personal discovery. Give me all the parents, tarot readers, herbalists, energy workers, mediums, homeopathic doctors, and holistic nutritionists who found their way to this work because they were healing something within themselves. 4 of Wands: I chose the 4 of Wands because personally, I am so grateful for the community that has supported me along this journey. Professionally, I love to throw a good party! 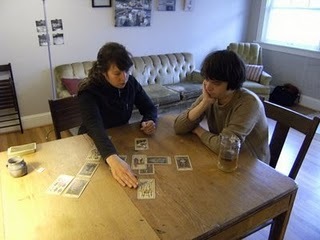 I am a traveling tarot reader. I do tarot events and tarot pop-ups with different businesses in Portland, Oregon. My community connections are very important to me. I also know I have a really specific skill set, but if I need assistance from someone else, I know I can find the assistance within my own network. Thanks for following along! I hope you enjoyed getting to know me. If you would like to get to know other tarot bloggers follow the links below! I feel like this is a great “Getting to know you ” reading! I love that you really acknowledged the parts of you that make you YOU as well as things a quarent would want to know about you the Professional Reader! Very cool! I loved getting to know you… getting to know all about you… (yes, sung to the same tune in The King and I). You sound like a very empathic and compassionate reader, yet with the strong sense of boundaries and truth that I’d like to think I have as a reader as well… though I think I’m probably a bit stiffer and range more to the Swordsy/Air style of reading. We all have our different styles, which is so wonderful: there’s no real competition but collaboration and celebration in this field! I would LOVE to do readings at a wine bar: making a mental note to contact some people locally! I’ve had an amazing experience at the wine bar I do readings at – I would recommend it! This is such a curious deck Traci; it draws you in and at the same time makes you pay attention to its energy! I’ll be keeping my eye out for it. I really love the energy of this deck. It truly brings a lighter perspective to the most serious questions. I love that vintage table cloth you’re using in the photo! It looks perfect with that deck. Thanks for introducing yourself! Thank you! I love vintage table clothes. I have a handful I use for different tarot events.